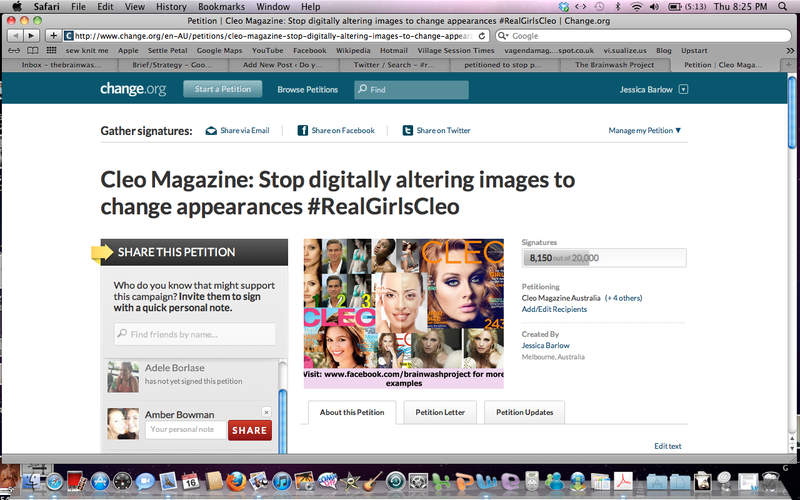 Cleo petitioned to stop Photoshop | Do you want to help create a better magazine for teen girls? The Change.org petition that I am running asking Cleo Magazine to print one unaltered photo spread per month and put disclaimers on images where body shape or appearance is changed, has gained a lot of momentum in the past 24 hours. The amount of signatures has more than doubled in the past eight hours. People are tweeting about it using the hashtag, #realgirlscleo and I was interviewed on 92.7 with Meryl Swanson and on ABC 774 with Rafael Epstein today. It has been a bit of a whirlwind but it is great to see that so many people support me. If you have time to chuck out a tweet with #realgirlscleo in it, I would be really grateful. Otherwise sharing the petition link on Facebook is a great way to spread awareness. “A MELBOURNE student has amassed almost 4000 signatures on an online petition calling on ACP Magazines’ young women’s title Cleo to stop digitally altering girls’ images and to do more to promote positive body image among its readers. To read more of this article: click here.